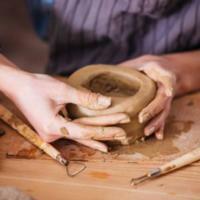 Details: Mud Makers ~ (Ages 9 – 12) Session 1: Wednesdays, 4:15 - 6:15 pm. February 6 - March 13. Instructor: Veronica Wilde Students in this class will learn hand building, some wheel throwing and glazing techniques. This is the perfect class to get started in our clay studio and build a foundation of tips and tricks to apply in more advanced classes. No experience necessary. $95/student, $80.75/member. *When signing up for a class, if you wish to bring a guest, indicate the number of guests under the ‘Guest Registration’ line. If you intend to attend the class on your own, please leave this section blank, so as not to register for extra spots and incur extra costs.